↑ Brewin, John (1 May 2008). "European Nations Cup 1968". ESPNSoccernet.com. ESPN. Retrieved 28 January 2013. ↑ "European Football Championship 1968 FINAL". 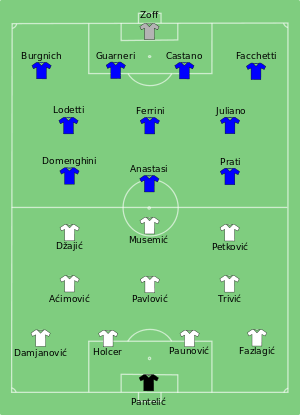 UEFA euro2000.org. Archived from the original on 17 August 2000. Retrieved 5 July 2012. ↑ "European Football Championship 1968 FINAL Replay". 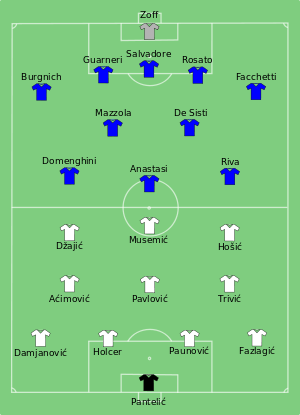 UEFA euro2000.org. Archived from the original on 29 August 2000. Retrieved 5 July 2012.